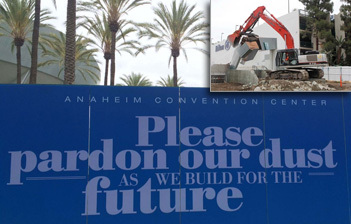 ANAHEIM, CA - (April 21, 2015) - The City of Anaheim today broke ground on the seventh expansion to the world-famous Anaheim Convention Center, for a significant construction project that will add more meeting space, more economic impact, and more jobs in Anaheim. The seventh expansion to the LEED-certified Anaheim Convention Center will add 200,000 square feet of leasable, flexible space to the building, solidifying its spot as the largest exhibition center on the west coast. The expansion site encompasses the existing Car Park 1 area that fronts Katella Avenue, east of the Convention Center Arena. Located in the heart of the Anaheim Resort District, the Anaheim Convention Center is an important enterprise operation the City relies upon to support the General Fund. The Anaheim Resort District provides approximately 50 percent of the General Fund tax revenues, which in turn provides for vital City services such as Fire, Police, parks and libraries. The expansion will allow the City of Anaheim to retain conventions that have grown in popularity each year, as well as provide space to attract new conventions and events. Without expanding, the City will lose business and revenue. Upon securing the funding for the project in November 2014, the Convention Center has already secured more than 10 new groups that will utilize Anaheim for their meetings and conventions. Additional tax revenue from the expansion is projected to be more than $9 million annually. An estimated 1,860 jobs will be created during construction, and the expansion will support more than 2,000 new jobs annually. Turner Construction Company and architecture firm Populous were selected to provide the design-build services for this project. Both Turner and Populous have enjoyed tremendous success and longevity in their respective fields and are known as leaders in the convention center design and construction industry, as well as design-build contracting. For more information and to sign up for timely construction news, please visit www.accexpansion.com.